“Hollywood” Danny Faria Jr. earned the night’s Specialty Fasteners Hard Charger Award with an eighteenth to seventh place run. “The Magic Man” Mike Martin scored the Wilwood Disc Brakes “Lucky 13 Award” with a thirteenth place finish in the feature. “The Demon” Damion Gardner scored his 83rd Woodland Auto Display Fast Time Award over the 28-car roster by posting a time of 16.516. The ten-lap heat race victories went to “Chargin” Charles Davis Jr. (Extreme Mufflers First Heat), R.J. Johnson (Circle Track Performance / Ultra Shield Race Products Second Heat), and Verne Sweeney (Saldana Racing Products / ButlerBuilt Seats Third Heat). Tommy “Thunder” Malcolm took the checkered flags in the 12-lap Competition Suspension Incorporated Semi-Main. The AMSOIL USAC/CRA Sprint Car Series thanks All Coast Construction, ButlerBuilt Professional Seat Systems, Circle Track Performance, Competition Suspension Incorporated, Extreme Mufflers, Five Star Grafix, Flowdynamics, Hoosier Racing Tire, Loudpedal Productions, Pyrotect Racing Cells, Saldana Racing Products, Specialty Fasteners, surfnsprint.com, Ultra Shield Race Products, Wilwood Disc Brakes, and Woodland Auto Display for their support. 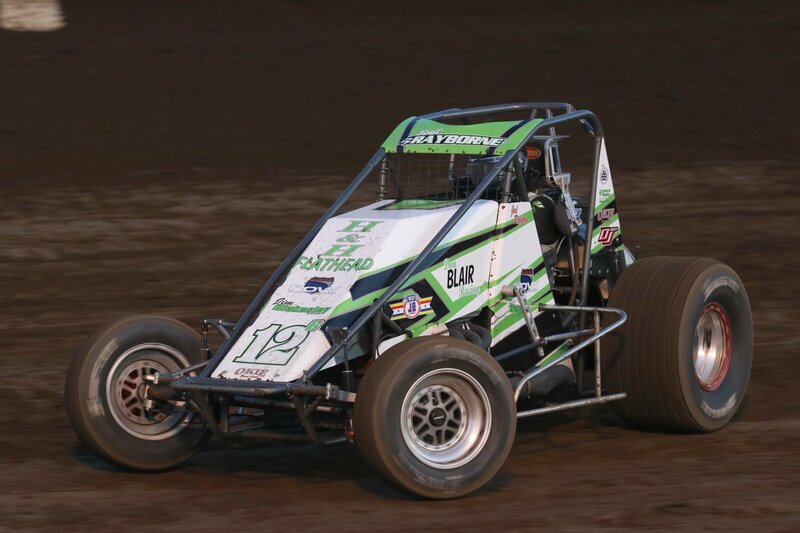 For more information on the series, visit usacracing.com and the social media for USAC Racing. You can also find exclusive content on the USAC/CRA Facebook, Twitter, and Instagram pages. Stevie Sussex went for a scary ride in qualifying. He exited the car quickly and appeared to be ok.
WOODLAND AUTO DISPLAY QUALIFYING: 1. Damion Gardner, 4, Alexander-16.516; 2. R.J. Johnson, 51, Martin-16.573; 3. Richard Vander Weerd, 10, Vander Weerd-16.700; 4. Jake Swanson, 34AZ, Grau/Burkhart-16.855; 5. Matt McCarthy, 28M, McCarthy-16.869; 6. Austin Williams, 92, Sertich-16.894; 7. Matt Mitchell, 37, Mitchell-16.931; 8. Jace Vander Weerd, 88, Vander Weerd-17.045; 9. Chris Gansen, 4G, Gansen-17.132; 10. Brody Roa, 91R, BR-17.137; 11. Stevie Sussex, 12, Allen-17.149; 12. A.J. Bender, 21, Bender-17.175; 13. Tommy Malcolm, 5X, Napier-17.235; 14. Cody Williams, 44, Williams-17.252; 15. Sterling Cling, 34, Cling-17.402; 16. Kyle Edwards, 39E, Edwards-17.415; 17. Charles Davis Jr., 50, Davis-17.513; 18. Eddie Tafoya Jr., 51T, Tafoya-17.548; 19. Verne Sweeney, 98, Tracy-17.649; 20. Danny Faria Jr., 42, Cheney-17.655; 21. Mike Martin, 16, Martin-17.762; 22. Jeremy Ellertson, 98J, Ellertson-17.800; 23. Joel Rayborne, 12B, Blair-17.910; 24. Jeff Der, 39, Cal-Sun-17.944; 25. Matt Stewart, 90S, Waitman-18.087; 26. Steve Hix, 57, Hix-18.156; 27. Randy Waitman, 90, Waitman-18.346; 28. Eric Englert, 35, Englert-18.446. EXTREME MUFFLERS FIRST HEAT: (10 laps) 1. Davis, 2. Gardner, 3. C.Williams, 4. Roa, 5. Faria, 6. Mitchell, 7. Hix, 8. Rayborne, 9. Swanson. 2:55.86. CIRCLE TRACK PERFORMANCE / ULTRA SHIELD RACE PRODUCTS SECOND HEAT: (10 laps) 1. Johnson, 2. Bender, 3. Tafoya, 4. Cling, 5. McCarthy, 6. J.Vander Weerd, 7. Martin, 8. Waitman, 9. Dyer. 2:58.23. 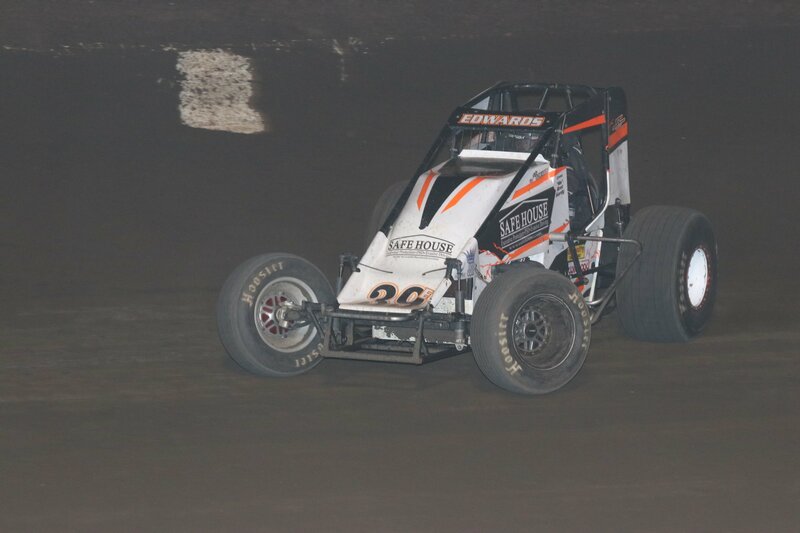 Veteran racer Verne Sweeney picked up a very satisfying heat race win. SALDANA RACING PRODUCTS / BUTLERBUILT SEATS THIRD HEAT: (10 laps) 1. Sweeney, 2. A.Williams, 3. R.Vander Weerd, 4. Edwards, 5. Malcolm, 6. Gansen, 7. Ellertson, 8. Stewart, 9. Englert. 2:59.74. **Sussex flipped during qualifying. Mitchell flipped on lap 16 of the feature.